A pictour is a great way to capture fun family moments. Photo: Lindsey Kent. There are a few things that every woman thinks about when preparing for a trip: where to stay, where to dine and what to wear so she looks good in photos. And if the trip is to Paris, knowing what to wear is even more important because these photos are going to be Paris photos, and is any city more romanticized by photography than Paris? Admit it, you come to Paris with visions of the photos you want to come home with. But even with the right outfit and the vision, a few problems remain: Who will take the photos? Where are the best spots to take them? We’ve all been faced with these challenges before. Whether you’re traveling solo, as a couple or in a group, you might not know which angle is best for an Eiffel Tower shot or which romantic carousel has the best lights. Or which quai by the Seine is the easiest to get to and walk on so you still have a view of Notre Dame. Or which time of day is best for taking photos in front of I. M. Pei’s famous Louvre pyramid. When you’re a visitor to a new place, there are so many questions but so few answers. Honeymooners love pictours as a way to remember their special trip. Photo: Lindsey Kent. Not only is there the challenge of the right place and right time, but there is also the ongoing difficulty of finding people to take the actual photos. Will they speak English? Do they mind taking more than one? What if it’s blurry and you don’t want to tell them? Or worst yet, what if they steal your camera? 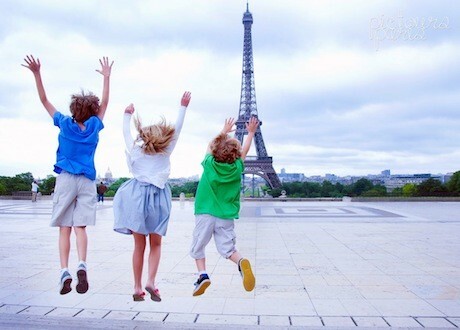 Picture-perfect Paris photos are now attainable thanks to Pictours Paris, started by an American, Lindsey Kent. Pictours Paris provides walking “pictours” of the city while taking professional photos of you—so you never have to worry about the hassle of a camera. Just come looking fabulous and let Pictours Paris do the rest. Pictours Paris founder Lindsey Kent is always prepared to her next shot. Photo: Kristen Beddard. My husband and I never did engagement photos, so when I discovered Pictours Paris, I thought it would be a great way to celebrate our first wedding anniversary. There is no better backdrop for romantic photos than the City of Light! We chose to meet up with Lindsey at a time when we would have light from the end of the day, the early evening sunset and the infamous blue light that Paris has after the sun dips. From the moment I met Lindsey, I knew our pictour was going to be a fun adventure. Her bubbly personality put us both at ease as we walked from the Palais Royal to the Passage Vivienne and back to the Louvre for sunset shots. My husband does not love having his photo taken, and Lindsey was very sensitive to this issue, so he soon felt more than comfortable. Also, I was pleasantly surprised at Lindsey’s knowledge of hidden areas throughout the city. Even though we live in Paris, our pictour provided us with a different view of the city. We finished our tour by the Eiffel Tower and Trocadero, with the vast Paris evening sky in the distance. I can’t wait to send out our Christmas cards to family back home. We are so happy with our photos that I have a feeling there will be another pictour in my future! My husband and I used Pictours Paris to celebrate our first anniversary. Photo: Lindsey Kent. While the majority of Lindsey’s tours are for honeymooners or couples (yes, she’s been the secretive person picnicking in the background to capture proposal moments! ), Pictours Paris is also popular for families, groups, solo travelers and even pets. Lindsey enjoys collaborating with clients to tailor a tour that achieves their Paris photo vision. For an extra-special touch, Pictours Paris works with Charles Gillman Cosmetics, so professional hair and makeup can be added to your tour to make sure you have the perfect look for your shoot. Are you planning your wedding in Paris? Pictours and Charles Gillman Cosmetics also offer Paris bridal packages for the big day. Pictours Paris basic tours begin at 350 euros. This price includes the session and 50 high-resolution, edited photos sent through online delivery. You can contact Lindsey at pictoursparis.com or [email protected] You can also follow Pictours Paris on Facebook and Twitter. If you are looking for a photography class in Paris and want to learn how to take your own magical photos, check out Better Paris Photos, a partner of the Girls’ Guide to Paris Travel Club. Editor’s note: We are so happy that Pictours Paris is our new partner, offering $25 off if you’re a Girls’ Guide to Paris Travel Club member.